Everyone knows that Montgomery County’s traffic congestion is terrible. And data from the Maryland Department of Transportation (MDOT) shows it is getting worse. MDOT collects data on road lane miles (capacity) and vehicle miles traveled (usage) for all jurisdictions in Maryland going back through 1993. We show those two measures for MoCo below. Both capacity and usage have been increasing since the 1990s but at different rates. There are roughly three distinct periods of capacity and use from over the last twenty five years. 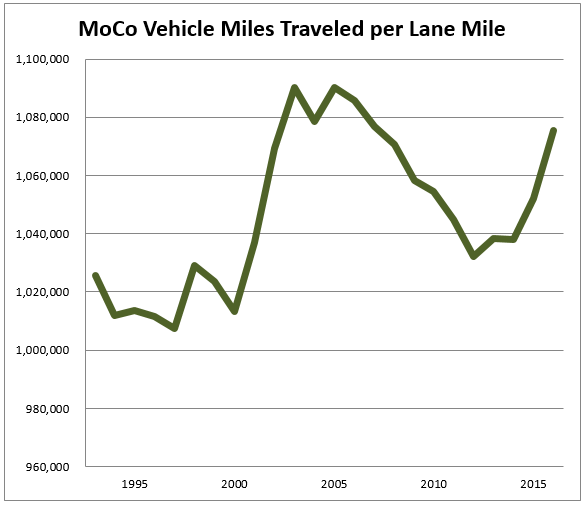 From 1994 through 2002, both lane mileage and vehicle miles traveled (VMT) increased, with usage growing 45% faster. 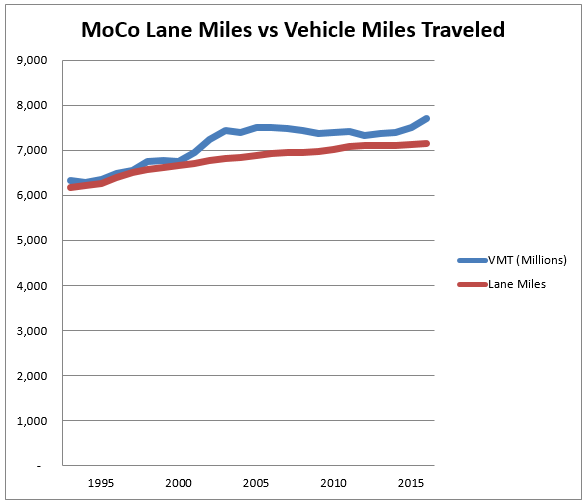 From 2003 through 2011, VMT grew at about half the rate of lane mileage. Two factors drove that: less driving during the Great Recession and its aftermath and the construction of the Intercounty Connector. But from 2012 through 2016, lane mileage virtually stopped growing while VMT picked up again. Road usage is now growing roughly four times as fast as road capacity. Here is the result. The chart below shows vehicle miles traveled divided by lane mileage – in other words, net average congestion. After getting worse every year through 2005, VMT per lane mile fell during and after the Great Recession. But now congestion is getting worse again as road construction has virtually ceased, Metro has had service problems and new transit options are not yet online. Traffic congestion is a serious challenge for the health of our economy and our quality of life. It will require bold solutions, significant investment in both roads and transit and wise budget management to finance new projects and maintain existing ones. That’s going to be hard as the county’s revenue growth has fallen at the same time it has raised tax rates and its debt is close to being maxed out. Still, doing nothing is not an option. We want you to know what you think about solutions to Montgomery County’s traffic. Click here to share your comments with us.